If you have a paper that you would like to share with the community, please send us a note at: ina@princeton.edu. 2001. 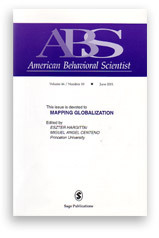 Edited a special issue of the American Behavioral Scientist (44:10) dedicated to the analysis of international networks. Eszter Hargittai (Princeton) and Miguel A. Centeno (Princeton), "Defining a Global Geography"
Edward Kick (Utah) and Byron Davis (Utah), "World-System Structure and Change: An Analysis of Global Networks and Mobility across Two Time Periods"
Brian Uzzi (Northwestern) Mike Sacks (Northwestern), and Marc Ventresca (Northwestern), "Global Institutions and Networks: Continent Change in The Structure of World Trade Advantage, 1965-1980"
Albert Bergesen (Arizona) and John Sonnett (Arizona), "The Global 500: Mapping the World Economy at Century's End"
Gary Gereffi (Duke), "Mapping A Commodity Chains Framework for Analyzing Global Industries"
Matthew Zook (UC Berkeley), "Old Hierarchies Or New Networks Of Centrality? The Global Geography of The Internet Content Market"
Anthony Townsend (MIT) "Networked Cities and the Global Structure of the Internet"
Stanley D. Brunn (Univ. Kentucky) and Martin Dodge (London), "Mapping The 'Worlds' of The World Wide Web: (Re)Structuring Global Commerce Through Hyperlinks"
George Barnett (SUNY Buffalo), "A Longitudinal Analysis of the International Telecommunications Network: 1978-1996"
Thomas Schott (Pittsburgh), "Global Webs of Knowledge: Education, Science and Technology"
Barry Wellman (Toronto), Emmanuel Koku, (Toronto) and Nancy Nazer (Toronto), "International Scholarly Networks"
Globalization involves a variety of links expanding and tightening a web of political, economic and cultural inter-connections. Individual data indicate that we are undergoing a process of compression of international time and space and an intensification of international relations. Yet, individual data sources tell us little more than that. This article offers an alternative approach to studying globalization by highlighting the possible contributions of network methods to the field. We argue that using relational data helps in uncovering the intertwined nature of the emerging global order. This paper uses network analysis to explore what changes in international telecommunications reveal about the process of globalization. This paper was previously published as Migration and Development Working Paper #98-07, Princeton University. A list of links to previously published related works. 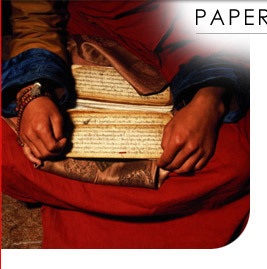 Please let us know if you have a paper that you would like have featured here. We can either link to your paper on your Website or store it locally on our server. Click here to learn more. The Archive will periodically publish edited volumes featuring the work of Associates. Latin America: Regionalization or Globalization?